Rich Davis died earlier this week. Not familiar with the name? You should be. 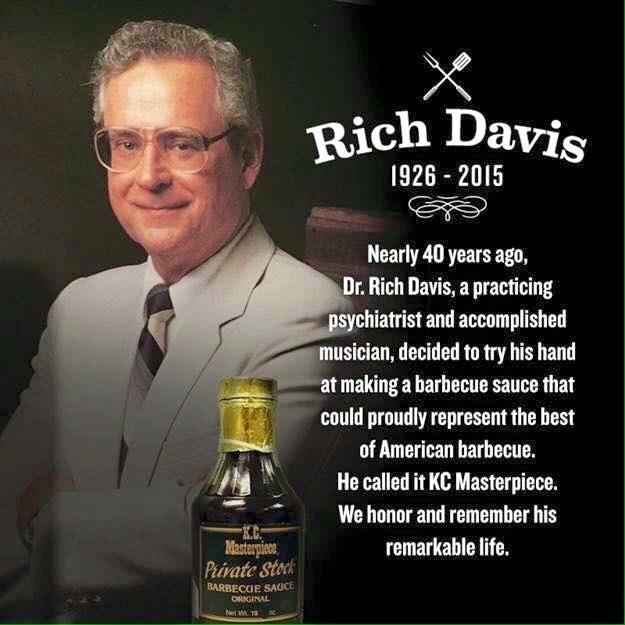 Dr. Davis (he preferred to be called Rich) was one of the guiding lights of 20th century American barbecue, and his sauce—KC Masterpiece—came to define the quintessential American barbecue sauce. He was a gentle soul, a generous humanitarian and a great friend to Steven Raichlen. I first met Rich when I was writing BBQ USA. I interviewed him about the origin of KC Masterpiece (more on that below). I mentioned I was researching the history of American barbecue, and Rich made one of the most generous gestures one writer can to another: he turned over to me his vast archives on barbecue history in the New World. If barbacoa and Gonzalo Fernandez de Oviedo y Valdes (the Spanish explorer who first wrote about it) are familiar to most barbecue geeks, it’s thanks to Rich and his archives. Davis carried these lessons with him as he pursued a career in medicine, first as a family and child psychiatrist, then as an educator and dean, finally as a founder of a clinic and of the Eastern Virginia Medical School in Norfolk, Virginia. But he always kept his hand in barbecue, attending smoke fests on the weekend, constantly tinkering with and improving his sauce. In 1984, Davis retired from medicine to pursue his lifelong passion. “People always loved my sauce, so I decided to see if I could make it a commercial success,” Rich said. Rich studied what people liked in their barbecue sauce in other parts of the country: vinegar in the Carolinas, mustard in Georgia, chili powder and cumin in Texas. Given Kansas City’s central geographic location, it made sense to Rich to incorporate these regional elements into his sauce. The base would be tomato, of course, because Americans love tomato sauce. (Consider the popularity of ketchup.) For sweeteners Rich chose molasses and corn syrup—the former for its earthy, malty taste, the latter for its luscious mouth feel. Vinegar would offset the sweetness, while cumin and chili powder would kick up the heat. But something was still missing, and Rich thought about it hard and long. Then it occurred to him: “What people really like about barbecue is the smoke.” So he added a shot of liquid smoke and uttered one of the resounding “eurekas” of culinary history. KC Masterpiece was born. To distinguish his sauce from the other bottles on the shelves, Davis put a simple black and white label on the bottle. To build the business, he brought in his two sons. Sales boomed in the Midwest, but Davis wanted to see his sauce go national. (“You need 50 million dollars to launch a food product nationwide,” explains Davis.) So in 1986, he sold the sauce to the Clorox Company. Rich once came to Barbecue University to teach a workshop on making barbecue sauce. Our students and staff remember him for his courtly demeanor, boundless enthusiasm, and his extraordinary kindness. America has lost an icon of barbecue and my assistant, Nancy, and I have lost a friend. 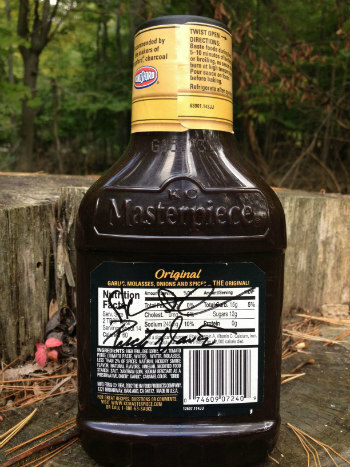 Rich Davis’s Great Wall Barbecue Sauce: Dr. Davis’s contract with Clorox forbade him from disclosing the recipe for KC Masterpiece, of course, or even from giving another barbecue sauce recipe. But he did oblige us with the following “doctor sauce” (a sauce that starts with a commercial sauce that you “doctor” to suit your taste). In this case, the doctoring includes ginger, rice vinegar and soy sauce—ingredients that give the sauce a Chinese accent that goes great with pork tenderloin, ribs, and duck. Rich got the idea for the sauce on a trip to China. Click here to get the recipe.